When my order arrived I received two tins of their wax. The tins they sent me were their best-selling scents, which when they arrived I could see why they were. Man’s Face Stuff is known for the various different scents that they have. The scents of these waxes were very different from any of the other waxes I’ve reviewed. 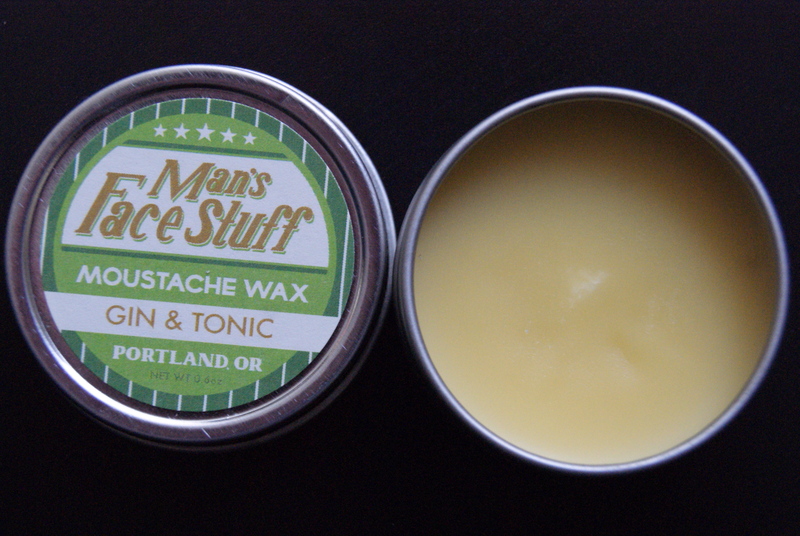 The first wax that I tried was the “Gin & Tonic”. When you open the tin you see a light yellow wax, and the scent of the wax is what I would guess Gin & Tonic to smell like… I don’t drink, but I’m not sure Gin and or Tonic has much of a scent, BUT I know that usually you get a lime slice with your drink SO the scent that I get from this wax is Lime… The scent is somewhat overpowering at first but once in the ‘stache the scent dissipates throughout the day. The second wax they sent me was their “All Nighter”. Opening this tin you see a light brownish wax (almost like Coffee). The smell of this wax is a little confusing to my nose. On their website they say “contains notes of fresh pipe tobacco, sweetened coffee, and just a hint of frankincense.” Well I do get the coffee, and pipe tobacco… And what the hell is frankincense… Well I looked it up and the scent that it brings to the table is – balsamic-spicy, slightly lemon.. And if I try hard enough I can get a slight hint of it. Now the scent of this wax is like the other, a little overpowering. 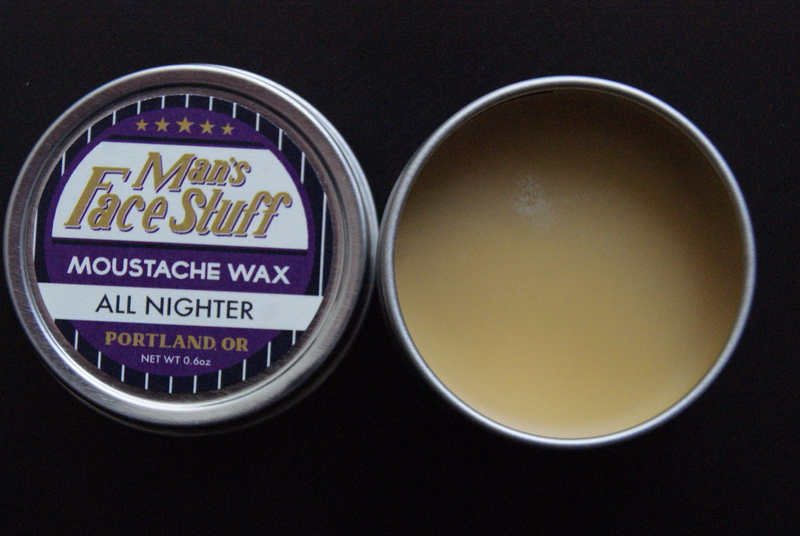 I find this wax to be a little bit more overpowering then the last, but like the other it wares off over the day. Now the only thing different from the two waxes that I can tell were the scents, other than that, I could see no difference in the hold, how it is to warm and apply. I would say that the waxes are a medium hold. Scraping it out of the tin is quite easy, and warming it between your fingers is again relatively easy. This is a wax that I didn’t need any extra help to warm up. Just a little bit of time in the fingers and it was warmed enough to spread into the ‘stache. Since this is a medium hold wax I was still able to achieve the large curls that I like, but I did have to worry about droopage as the day went on. Overall I would say Man’s Face Stuff has some unique waxes! The scents are great, and the hold is good for a sweeping ‘stache. If I were you I’d head over to their Etsy site and check them out and their various scents they have! They sell their 1oz tins of wax for $9 so this wax is right smack in the middle of the price range. 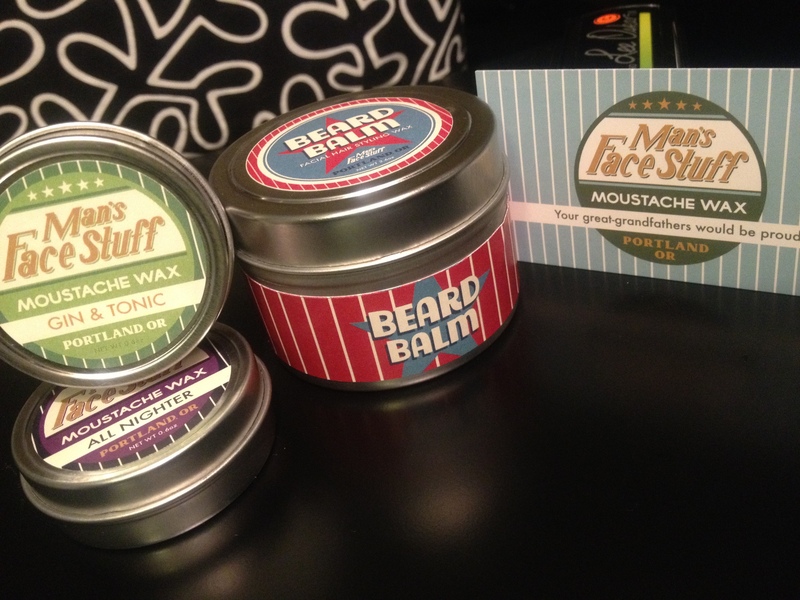 Thanks to the guys from Man’s Face Stuff for the support of the blog and sending me some great stuff! 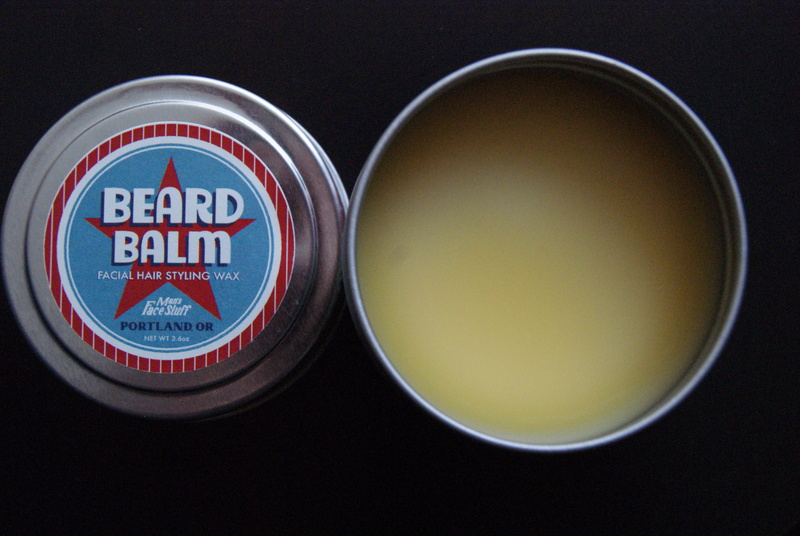 I also ordered a tin of their Beard Balm, and this stuff is also a great product! The smell of this is Tea Tree Oil, which is a great healthy natural smell. This is a very light wax that spreads nicely through the beard and keeps stray hairs in place for a cleaner looking beard. At $18 for a 4oz tin, if you have a Beard and need to reign it in, then get yourself some!